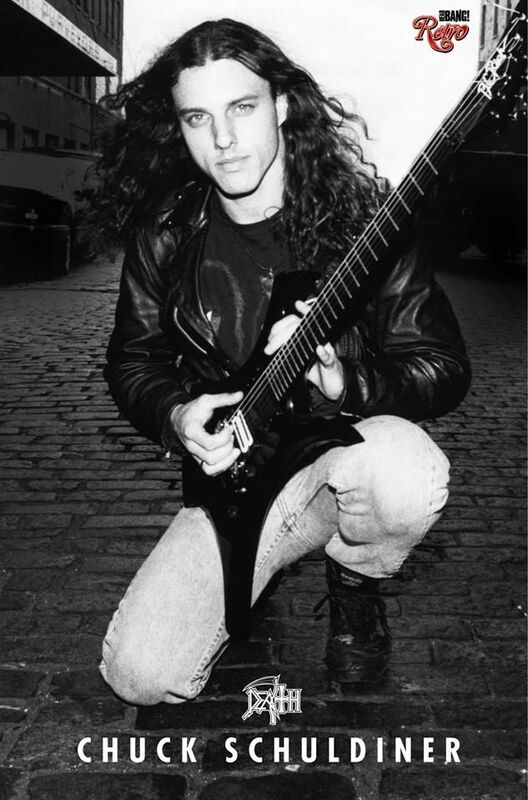 Chuck Schuldiner who once played crushing music that popularized Death metal before attempting to follow the mid 90s phase where every Underground band had to somehow rise to face the more rock influenced bands at their own game through whinier passages and trivial lyric matter. During that period his technical abilities increased but his inability to arrange worthwhile music become obvious rather as he relied exclusively on rock structures that culminated in a solo before repeating the whole process without any thoughts on progression, narration or momentum. This created the effect where some truly incredible melodies were juxtaposed next to some very mediocre sections derived from rock and other genres. This device was then taken by a large number of bands who have then used it to promote a singular idea over everything else and has contributed largely to the decline of metal in general. Let us look at a few moments where the Chuck Schuldiner syndrome was very apparent. 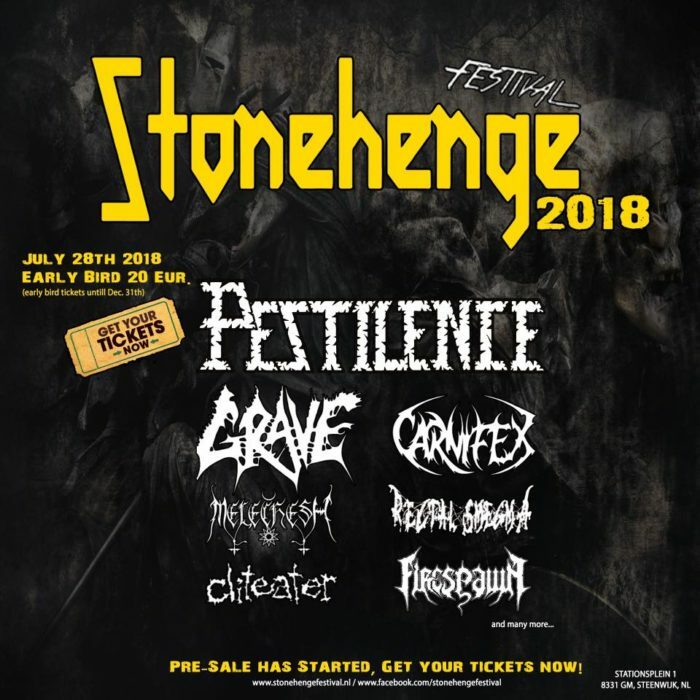 Pestilence and Grave are booked to play the 2018 iteration of the Stonehenge festival in the Netherlands. As a death metal listener, I always ended up favoring the more melodic, complex substyles as exemplified by the work of bands like At The Gates and Necrophobic. Grave isn’t those, never was them, and probably will never will be. I can’t really fault them for their lack of ambition, but the impression I derived from previews of this album’s tracks seems generally accurate. Out of Respect for the Dead is an adequate recording, considering that it’s a retread of a basic style with few detours into others, but the aforementioned lack of ambition makes it difficult to appreciate the expertise Grave displays in their small niche. As a deathpop album, this succeeds and fires on more cylinders than much of the other deathpop I’ve listened to in recent months. The song structures, while generally basic and reliably verse/chorus, show some expertise in hiding it through simple techniques like varying up the bridges and not forcing the vocalist to repeat the title of the song every 15 seconds. Furthermore, Grave tends to shove their most memorable riffs towards the beginning of each track; while this is a compositional limitation to be overcome, it’s a good idea from a commercial stance since it’ll at least recapture the attention of audience members whose interest might end up fading otherwise. Other hooks are carefully sprinkled throughout the tracks – the occasional “big” riff combined with some skilled use of tempo and texture shifts helps to maintain a basic level of musicality and memorability throughout the album. The product remains simple and accessible enough in spite of its consistent death metal aesthetic; and thusly Grave is guaranteed to sell albums, although I don’t know how much money they’re actually making off their musical legacy since the death metal niche is still not particularly large. These successes are assuredly not enough to push Grave to the top of the Swedeath pile. They’ve clearly practiced their style to the point that it’s probably trivial for them to pump out a new album semi-regularly. However, most of the strong points of these songs merely make me wish that Out of Respect for the Dead was more ambitious in its songwriting. A failure in that regard is arguably more noble than a lack of effort, although from a philosophical stance that’s not a debate of particular importance or merit, especially when other bands have succeeded. If you absolutely need ultra-basic death metal in the Swedish vein, though, this will probably satisfy your needs. Out Of Respect For The Dead is in my review queue by virtue of its artist being at least semi-famous. While Grave’s reputation on DMU is something less than stellar, the fame they achieved as part of the early (Stockholm) Swedish makes their latest work worth looking at, at least in terms of comparison to their past and other bands’ present output. “Plain Pine Box” is admittedly not a particularly interesting song, being an extremely simple and basic track reminiscent of what would happen if you simplified Celtic Frost and added extra distortion. A previously released track from this upcoming album (“Mass Grave Mass”) resembles more the band’s stereotypical sound; overall, I expect competence from future Grave if not necessarily must-have or even particularly inspiring albums. Out Of Respect For The Dead will be available on October 16th, 2015. Back around 1991 or so, Grave Into the Grave lived in every Hessian room across the land. It combined an intense rhythmic attack with a type of accessibility that did not on the surface resemble the pop music — generally downtempo bittersweet wailing indie-rock — of the age. Then the band seemed to drop out of reality. Listening to Necropsy: The Complete Demo Recordings 1986-1991 has clarified for me exactly what I like and detest about this band. Unlike most bands of that era, Grave understood the concept of hook, in this case a rhythm that is fascinating enough to be instantly memorable. On the downside, the hook swims in what are ultimately predictable song structures borrowed from the lower echelons of 1980s speed metal. These demos show Grave developing its style from an early Possessed/Kreator hybrid into full-fledged death metal, yet the band never really breaks into what made death metal powerful. These songs cycle through verse-chorus with exceptions made to fit in some transitional riffs, but never construct themselves around an idea expressed in both riff and song. As a result, they come across as random outside of the one moment of clarity for the hook, at which point the brain goes to sleep waiting for the random power chord slamming to end and the hook to come around again. The good parts of Grave should not be understated. At a time when most bands were trying to make themselves presentable to the average music listener by reining in their extreme tendencies, Grave leaped howling into the abyss with rigid and abrupt riffs that slammed home with the intensity of the big American bands. Much like style-mates Seance and Hypocrisy, Grave took Swedish death metal away from the melodic riffs and restraint into full-on textural assault with primitive rhythm as its guide. And yet listening back over this, one might wish for a little bit more of Carnage and Entombed in with the Malevolent Creation style riffs. The song structures are too simple to give these riffs room to breathe, so they just cycle, which is to say raw repetition “one removed” by introduction of a contrary or at least different theme. If tied together with some melody, more structure, or even a greater sense of internal dialogue between the songs, the early work from Grave would have been legendary and far surpassed Entombed and others who made big names for themselves in Swedish metal. These demos progress from the prescient in style works of the 1986-1988 period in which bands were still figuring out how to work with the fertile ferment of Bathory, Hellhammer, Possessed, Sepultura, Sodom and Slayer. The Grave tracks from this era sound like a second-rate speed metal band imitating Possessed as death vocals ring out around clumsier versions of riff patterns you might find on a Heathen or Dark Angel album. As time goes on, the riffs pick up more technique and the clumsiness becomes an aggressive slamming rhythm mated to an adroit sense of pick-up rhythm that conserves and intensifies the energy of each riff. But, much as with Kreator, the riff is the hook and the “sweet spot” in the midst of relatively unrelated material, which means songs keep clunking along on the rhythm of the drums and vocals while the guitars do random stuff. It’s as if these bands never fully come together and are just too individualistic for their own good, Kreator especially. As the demos accelerate toward 1991, the technique streamlines into recognizable full death metal, but the song structures revert to the 1986 styles and despite increased proficiency remain just as clumsy in end result. What emerges from these demos as a result is a crash-course in how to write great death metal riffs without writing great death metal. Grave faded before its time because it never knitted these power riffs into full songs, and went after the German model of a friendly rhythm with great hook in a song where everything else is essentially linear. This makes the listener fade in for the hook, then fade out, and end the listening session with no sense of continuity or overall impression of an event, emotion or attitude. In this, Grave — despite having mastered the science of death metal riffcraft — missed the boat on the innovation that death metal brought to the wider world of heavy music, and this explains why their work has not obtained the staying power assigned easily to bands with less-powerful riffing but more focus on integrative songwriting. 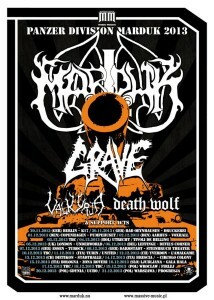 Third-wave black metal band Marduk and legendary brutal Swedish death metal band Grave will be joining Death Wolf and Valkyrja on a European tour. Marduk, perhaps most famous for its fast melodic ode to the unknown Opus Nocturne, will headline all dates on the “Panzer Division Marduk 2013” tour. 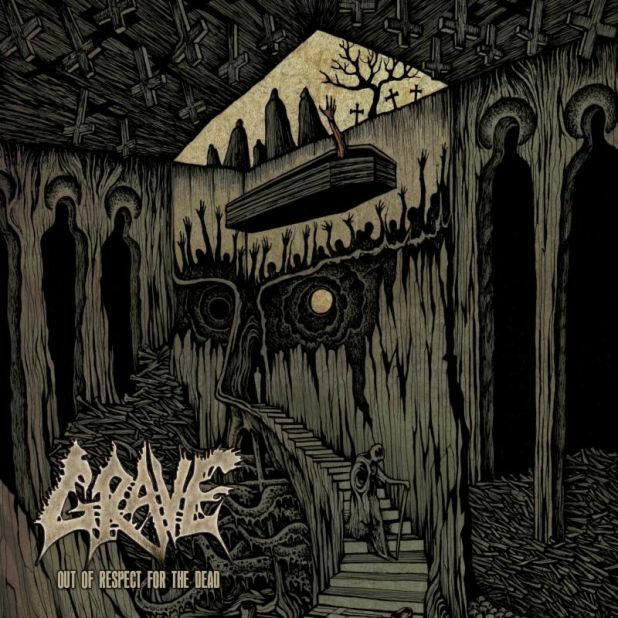 For those who experienced early death metal, Grave is well-known for 1991’s Into the Grave, a dark and primitive Swedish death metal journey that straddled the line between dark death metal, brutal death metal and primal grindcore. Among metalheads of the day, not owning a copy of this seminal release was like not owning shoes. This European tour sees these bands join forces for raw energy through intense speed and solemn but vicious riff attack, which is how each has distinguished itself in the past. European metal brothers and sisters are lucky to experience this unrestrained assault of sonic power. 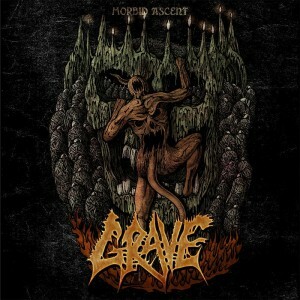 Today classic Swedish death metal band Grave releases its comeback EP, Morbid Ascent, featuring four tracks of death metal and a cover of a Satyricon song. The US version of this release is pressed on mustard-yellow vinyl and can be purchased Century Media. Known for their debut album Into the Grave from the early 1990s, Grave introduced the rudimentary form of the Swedish death metal sound to a new generation who appreciated the raw intensity of their primal music. 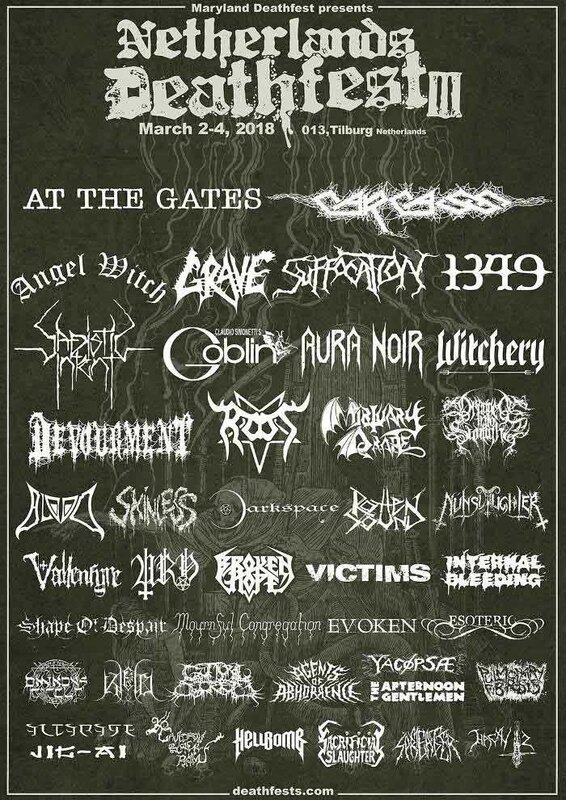 Joining a small circle of European bands who were as poundingly violent as their American counterparts, Grave became a staple before fading away in the late 1990s. Morbid Ascent shows the band resurrecting itself in the present era and attempting to adapt its classic sound and improved technical performance to the demands of a new time, following their 2012 release Endless Procession of Souls. 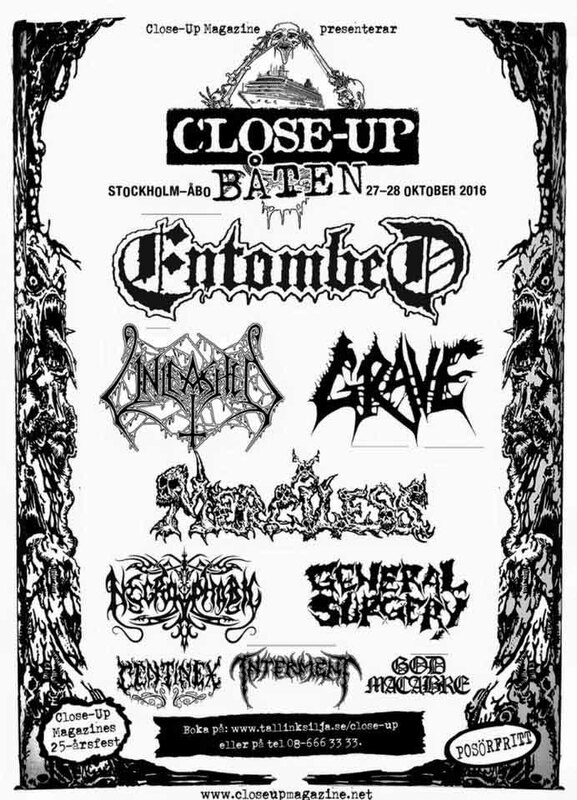 If you’re in Europe, you can catch Grave live on October 5 at Zombie Fest II in Oostenede, Belgium. Back in the early 1990s, it was hard to be a death metal fan without encountering Grave’s Into the Grave. 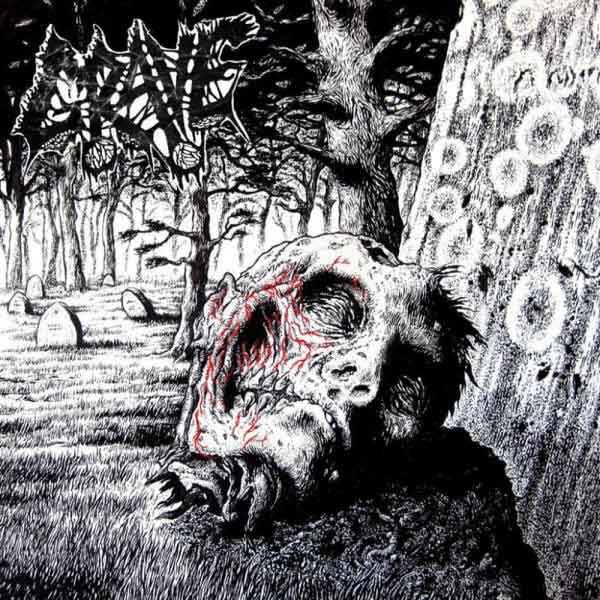 Primitive, music reduced to almost rhythm alone, it filled the niche between truly primitive grinding like early Napalm Death and the more musically intensive Swedish death metal like Seance. Fast-forward twenty years. Everyone in death metal, recognizing that their society was going to collapse of its own inertia amidst the confusion and denial of their fellow citizens, have gone on to have families, careers and lives. But in them burns that desire to be known for their place in an important time and activity in their lives, which is the production of death metal. Morbid Ascent is a new five-track EP with a cover of Satyricon’s “Possessed,” a remix of a past song “Epos,” and a re-recorded version of “Reality of Life,” a track from their 1989 Sexual Mutilation demo. The EP will be released both digitally and on vinyl and is available for pre-order at Century Media or on the band website.